Batteries: 3028 Lithium ion batteries required. Such a friendly puppy! Just pull the string and this pup will follow alongwhile wagging its tail. With its perpetual smile and wobbly gait, here is theperfect companion to be pulled along with an early walker. Brightly paintedwith child-safe paint. From the Manufacturer Melissa & Doug toys are designed to nurture creativity and imagination. 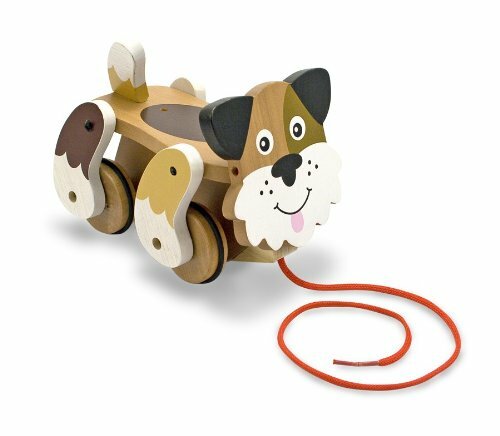 Fromclassic wooden toys to creative crafts, pretend play, and games, Melissa &Doug's products inspire exploration and enrich children's lives in a waythat's as engaging as playtime itself! Since the Company's founding more than25 years ago, Melissa & Doug has consistently delivered innovative children'sproducts with a commitment to uncompromising quality, safety, service andvalue. Well-designed, durable playthings should be accessible to all, andMelissa & Doug strives to foster wonder and a lifelong love of learning inchildren throughout the world.